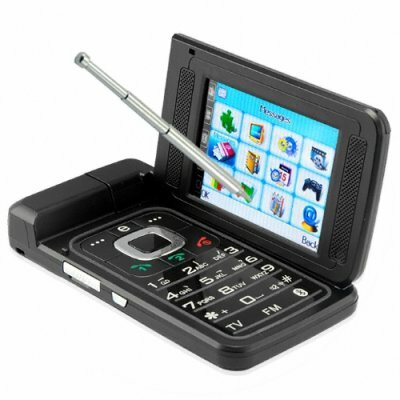 Successfully Added Clam and Sideflip Combo Cellphone - Touchscreen Media Phone to your Shopping Cart. GSM/GPRS clam and side flip combo multi media cellphone with Touchscreen, Dual Sim, Bluetooth, Micro SD, TV and FM radio as its signature digital features. This is a truly video friendly multimedia mobile phone with its sharp sideflip LCD screen for watching videos and TV in widescreen beauty. Not only does the screen rotate, but the images/videos on the screen change from portrait to landscape mode. This is a unique feature that is sure to dazzle your friends as well as your own eyes as you see the pictures automatically change with the orientation of the screen. The CVSCC-7200 is an easy to use touchscreen multimedia mobile phone with its friendly touchscreen interface and well designed software. Contained within the user friendly software interface are a bevy of multimedia features such as TV, FM Radio, MP3/MP4 player, digital camera and video recorder, image viewer, and Ebook reader. In particular, note the intelligent TV feature on this phone. Containing programmable and auto channel lists and pre-programmed country/zone settings for 29 major areas and a large screen for easy viewing, this is baby is as good as having a portable TV. If that wasn't enough, we packed the internal micro SD card slot with a 1GB card, so the phone comes out of the box ready to start loading up all your favorite media files. Unlike competing multimedia phones, this one is not locked into any particular network carrier, so feel free to use your unlocked cell phone with whatever carrier you prefer. The CVSCD-7200 not only has robust multimedia features, but also includes native tri-band GSM to keep you connected in more than 100 countries and has handy dual SIM card slots for keeping in touch with business and personal contacts from the same phone. A great mobile phone at the usual low Chinavasion wholesale price, order your sample today and prepare to be amazed at the latest in Asian media cell phones. This is the older version of the tri band tuchscreen cellphone. Please click here to see the latest version, in stock now. Clam and side flip combo multimedia cell phone. Mobile phone with side flip LCD screen for watching videos and TV in widescreen beauty. NOTE: This product is compatible with GSM at the three worldwide frequencies of 850Mhz, 900MHz, 1800MHz. Please check with your local provider if you are unsure of your local band requirement..